The badshah of action Akshay Kumar candidly acknowledged that no actor can ever replace the histrionics of Amitabh Bachchan and Dharmendra in SHOLAY. We agree because each actor in SHOLAY has played his character so brilliantly that no actor can repeat their performance. Even cameos by famous comedians like Jagdeep as Surma Bhopali and Asrani as the angreez ke zammane ka jailor became instant hit. What is amazing is that even miniature roles like the dacoits Kaliya or Sambha have become immortal. 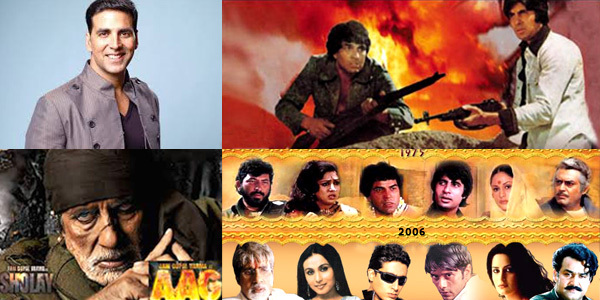 Though time and again there have many duplicates of SHOLAY but none could create the magic of Ramesh Sippy SHOLAY. Who can forget RAM GOPAL VERMA KI AAG which ace film director Ram Gopal Verma attempted in 2007. His idea of the contemporary version of SHOLAY with Amitabh Bachchan playing the key character of Gabbar Singh and South’s Mega Star Mohanlal playing the central character of Sanjeev Kumar went for a toss on day at the box office proving nobody can remake SHOLAY.